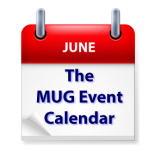 This week’s MUG event calendar sees is heavy on Mac utilities, with a presentation on Hazel at a Michigan group and Alfred at a Connecticut group. The Washington Post’s Robert Pegorano will address a Virginia group, while iMovie Magic will be the topic at an Australian group. Lots of great meetings going on this week in the creative pro category too, with demos of DaVinci Resolve in California, Washington D.C. and Chicago. Other topics scheduled include iOS 9, El Capitan, Automator; iTunes, Apple Photos, Google Photos and more. Wednesday 24-Jun Los Angeles Creative Pro Users Group – We are excited to welcome Blackmagic Design. Paul Saccone will demo the brand new not yet shipping DaVinci Resolve 12. This ain’t your fathers Resolve and you need to see it! Plus Benjamin L. Brown who shot, edited, produced and did the sound design on the movie, Harbinger Down, will talk about the film with an emphasis on using the Blackmagic Cinema and Pocket Cinema Cameras. Plus Tina Eckman will show off and remind us of all the announcements BMD made at NAB. Not enough? Well how about Michelle Boone showing off Imagine Productís latest application HD-VU2 which is a native file viewer that instantly views over 20 camera formats without transcoding. HD-VU2 is powerful enough to view 4K files including ARRI RAW, CinemaDNG and all the RED formats, not to mention GoPro, Panasonic, Sony and countless others! Gold Coast Macintosh User Group (Florida) – iOS 9 and El Capitan; What’s New with "Music"
Chicago Creative Pro Users Group – DaVinci Resolve; Filming a Documentary with the AJA CION; Creating a "Best Editing Portfolio"